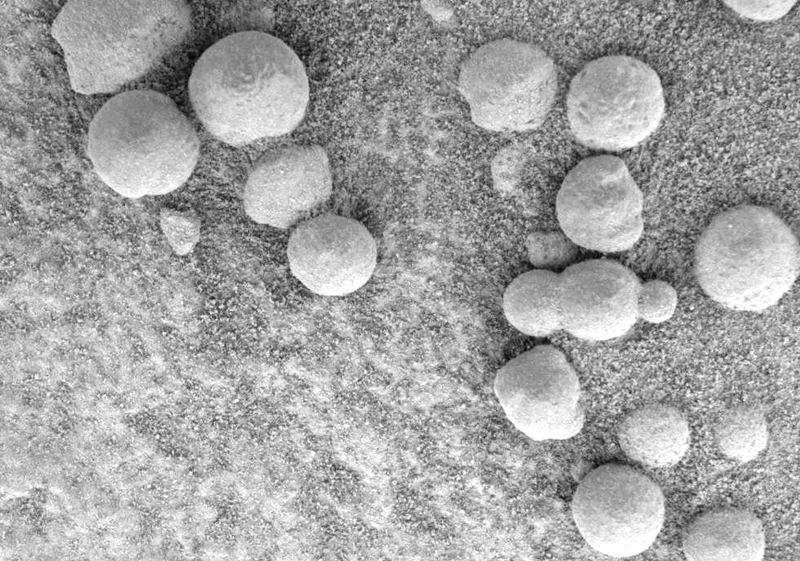 This microscopic image, taken at the outcrop region dubbed "Berry Bowl" near the Mars Exploration Rover Opportunity's landing site, shows the sphere-like grains or "blueberries" that fill Berry Bowl. Of particular interest is the blueberry triplet, which indicates that these geologic features grew in pre-existing wet sediments. Other sphere-like grains that form in the air, such as impact spherules or ejected volcanic material called lapilli, are unlikely to fuse along a line and form triplets. This image was taken by the rover's microscopic imager on the 46th martian day, or sol, of its mission. Such spheres could have been formed in the air, a combination of dust and water fused in early Martian thunderstorm-like conditions, possibly engendered by meteor strikes in the early Martian "seas", or the product of waterspouts in combination with a very dry, dusty and thin atmosphere formed as Martian twisters intersect the dying, warm and very salty Martian seas. Perhaps these blueberries periodically spewed out of a Martian weather-feature as a product of such Martian conditions. Hail and ice storms on earth sometimes form binary and triplets ice balls, if conditions are right. The Martian "Blueberries" could have been formed as a mixture of dust and water coalesced in such a storm, and were "air dried" in much the same way as water is frozen in thunderstorms on earth. Martian meteorologists should consider this angle as a possible cause of the blueberries, as a product of the conditions during various stages in the transformation of the Martian atmosphere over the eons. These have been collected by my son in northern Sahara. Could they be formed by the sort of process Jon Forringer put above ? You guys should check out the main forum there are many more people to discuss your ideas with.